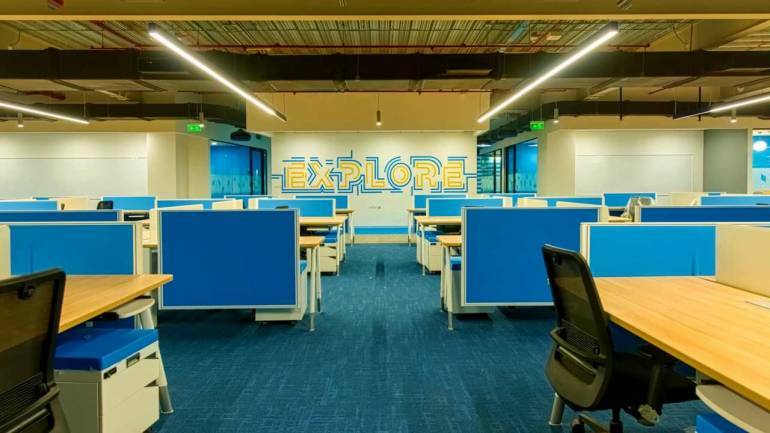 The office has total 30 floors spanning multiple buildings and has a capacity to house 7,400 employees which Flipkart says is enough for them. The buildings are connected by nine bridges. The gross leasing activity across seven major cities in India was pegged at 50 million sq ft in 2018. This was the highest in the last eight years and was driven by buoyant leasing in Bengaluru and Delhi-NCR, says a new report by Colliers India Research. Compared to 2017, gross leasing increased by 17 percent as occupiers continued to expand and consolidate. The top three sectors contributing to gross leasing were IT-ITeS (43%) of the total, flexible workplaces (14%), and BFSI (12%). Bengaluru retained its leading position in office leasing among the seven major cities in India, representing 28 percent of pan-India leasing volume despite 2018 witnessing 14 million sq ft of gross absorption, a decline of 9 percent year-on-year, the report says. The fourth quarter of 2018 witnessed notable supply of 2.86 million sq feet, a threefold increase from the previous quarter. However, 2018 overall witnessed a decline of 37 percent compared to the previous year, with only 8.0 million sq ft of Grade A supply. In 2018, the National Capital Region (NCR) recorded the highest leasing volume in the past eight years. The overall absorption of the region was 10.1 million sq ft in 2018, a 27.3 percent year-on-year increase. Delhi’s office market recorded gross absorption of 770,000 sq ft in 2018, representing an annual reduction of 41.4 percent owing to limited availability in quality developments. In the last two quarters of 2018, an additional 400,000 sq ft of supply was released into the market. Looking at future development plans from 2019-2021, Delhi is planned to see 3.9 million sq ft of office supply, increasing the existing office stock by 26.4 percent. In 2018, Gurugram witnessed gross absorption of 5.4 million sq ft, an increase of 19.8 percent year-on-year. The Cyber City micromarket emerged as the most preferred location, constituting 21.7 percent of overall leasing activity, followed by Golf Course Extension Road (GCER) and Golf Course Road at 15.8 percent and 12.1 percent, respectively. On the supply front, the city witnessed 1.4 million sq ft of new supply, which is the lowest since 2009. Noida’s office market witnessed record leasing activity in 2018 at 3.9 million sq ft, registering a significant increase of 86.2 percent year-on-year. In 2018, the Noida’s Grade A office market saw new completions of 1.5 million sq ft, increasing the city-wide stock by 5.2 percent. In the fourth quarter of 2018, Mumbai recorded gross absorption of 2.1 million sq ft, registering an increase of 5.7 percent quarter-on-quarter. Leasing activity was concentrated in the micromarkets of Andheri East (30%), Bandra-Kurla Complex-BKC (18%), LBS/Eastern Suburbs (16%), and Goregaon/JVLR (13%). In the fourth quarter of 2018, the city witnessed new supply of 1.03 million sq ft. This is only the second time Mumbai has seen over 1.0 million sq ft of new supply, after the second quarter of 2018. “Peripheral locations in major cities such as Bengaluru, NCR and Mumbai to gain occupier attention as they offer better quality contiguous space at lower rents. Moreover, flexible workplace operators in both central as well as peripheral business districts may see increased leasing. However, net take-up of space by occupiers may see lower growth given the growing need for workspace efficiency and cost effectiveness”, says Ritesh Sachdev, senior executive director, Occupier Services at Colliers International India. New supply declined by 20 percent compared to 2017 and stood at 26.3 million sq ft 2018. The delay in completions owing to a slow pace of construction and approvals resulted in the deferment of new supply. Bengaluru had the highest quantity of new supply at 8.0 million sq ft, followed by Pune at 5.8 million sq ft, the report says.